Last night I decided to skip Bodypump so that I wouldn’t be stuck at the gym till 7:30pm, which means not getting home till 7:50pm at the earliest. I LOVE Bodypump but I was in the mood for fast and efficient. So after my internship I grabbed a small apple for a pre workout snack and headed to the gym. I was super sweaty and ready to do some strength training. I did a leg workout which I modified to include some arms from PBfingers.com. 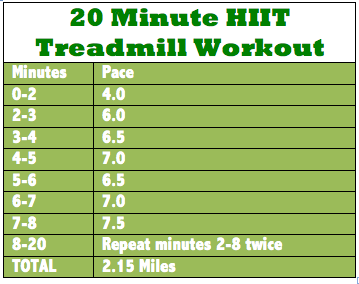 I modified it by adding bicep curls to the squats and tricep extensions to the lunges. Man those stability ball leg curls were surprisingly hard… I’m gonna feel that today. Then for dinner I recreated an omelet I made over the weekend. It was so good I was kicking myself for not snapping pictures of it then. That’s okay though because it gave me an excuse to make it again. 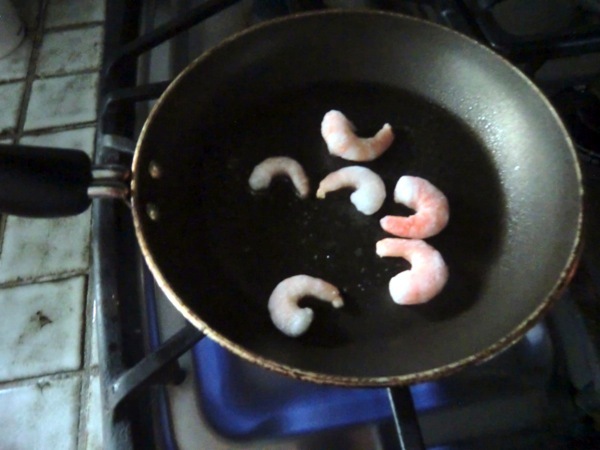 I started by sautéing the frozen shrimp with canola oil spray for about a minute. 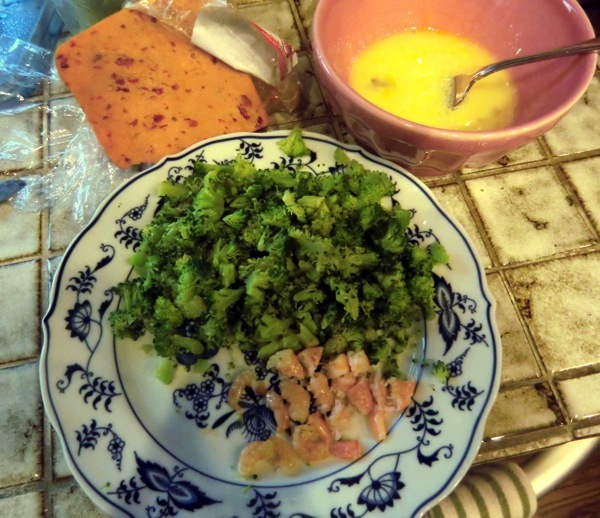 Meanwhile, I whisked the egg and egg whites together and chopped up the cooked broccoli. After the shrimp were thawed I cut them up too. 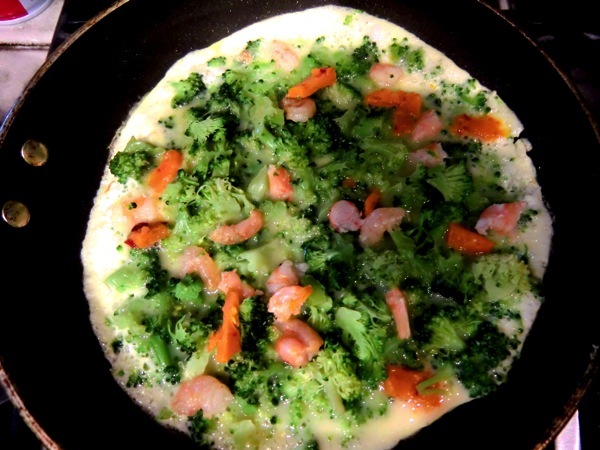 Next I poured in the whisked eggs and immediately added the broccoli, shrimp, and cheese into the mix. 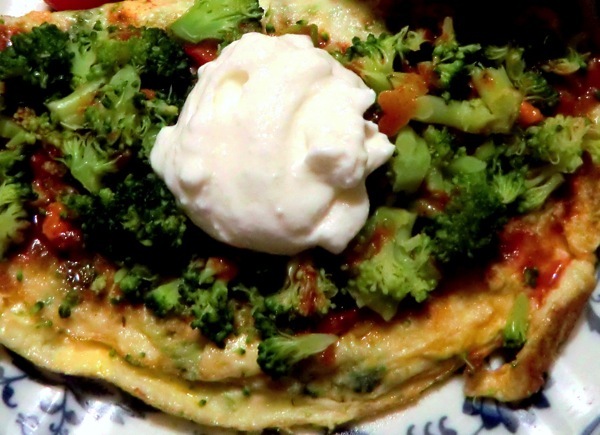 I topped mine with the remaining broccoli I couldn’t fit in the actual omelet …and with hot sauce, salsa, and fat free sour cream. (I can’t say I’m loving the fat free sour cream, I’m thinking I’ll be switching back to reduced fat after this.) I also had a handful of organic grape tomatoes on the side. It was a delicious dinner that it the spot, and again combined my favorite flavors: shrimp, spicy, and cheesy. It also had a full serving of vegetables, can’t go wrong there! Suggestions: Stuff this bad boy in a whole wheat tortilla for a more hearty meal. 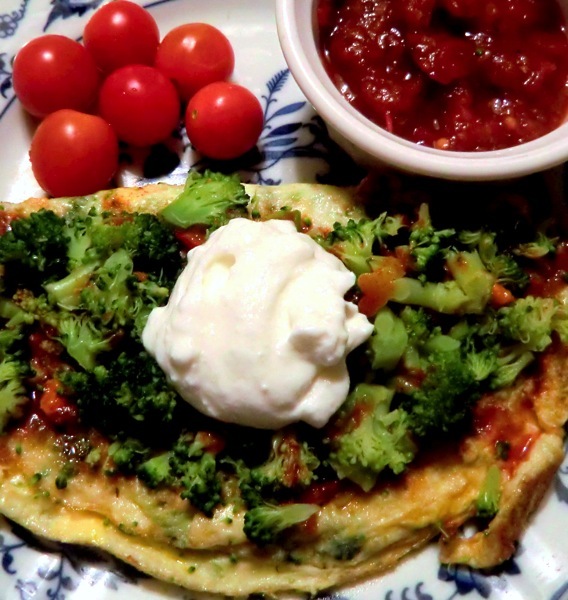 Use less cheese and/or all egg substitute/egg whites if you are watching your cholesterol.